Draft: 2010, San Francisco Giants, 11th rd. Grew up in Louisville, where he attended Butler High School, and played at Western Kentucky University, Chipola Junior College in Florida and the University of Louisville ... While a junior at Butler High suffered a cracked lower vertebrae while making a diving catch... Finished that season, but then had surgery and missed his senior year ... As a junior at Louisville started all 65 games and batted .328 with 11 home runs and 51 RBI... Served as the squad's captain. Split the season between Cincinnati and Atlanta, joining the Braves after a 7/30 trade from Cincinnati for RHPs Matt Wisler and Lucas Sims and OF Preston Tucker...Marked the second time in his career he was traded on 7/30; went to Cincinnati from San Francisco in 2015 for Mike Leake ... Hit .205 (68-for-331) with 15 home runs and 61 RBI in 105 games for the Reds…Hit .132 (7-for-53) with one extra-base hit (a double) and no RBI in 33 games for the Braves ... While with Cincinnati, homered once every 18.3 at-bats…Finished the season on a 68 at-bat homerless streak ... Named a left field finalist for the Rawlings Gold Glove Award…Finished with 17 defensive runs saved, the most by a left fielder in the N.L ... Started 82 of his 105 games with Cincinnati… Made nine starts with Atlanta ... Made his Braves debut on 8/2 at NYM…Went 0-for-3 with a walk ... Collected his first hit in a Braves uniform on 8/4 at NYM, singling as a pinch hitter ... Went 6-for-31 (.194) with one extra-base hit as a pinch hitter, including 3-for-17 (.176) in that role with Atlanta ... Hit .381 (8-for-21) with two home runs with the bases loaded…Was one of nine National League players to hit multiple grand slams…Boston's Xander Bogaerts was the only major leaguer to hit three ... The grand slams marked the second and third of his career…His first slam of the season came on 5/30 at ARI (off Patrick Corbin) and his next home run was also a grand slam: 6/13 at KC (off Jason Adam). Established career highs in games, hits, batting average, doubles and total bases...ranked among the National League leaders in extra-base hits (5th), doubles (T7th), HR (T10th) and RBI (12th)...joined Adam Dunn as the only left fielders in Reds history to produce in a season at least 35 doubles and 31 HR...Dunn had 35 doubles and 40 homers in 2005...for the second consecutive season was a finalist for the Rawlings Gold Glove Award for left fielders...led all Major League outfielders with 15 assists, most by a Reds outfielder since Pete Rose had 15 assists in 1973...prior to the All-Star break hit .278 with 27 doubles, 20 HR and 61 RBI...during the second half hit .212 with 10 doubles, 11 HR and 38 RBI...made his first 132 starts of the season batting cleanup, then in his last 17 starts beginning 9/10 hit fourth once, fifth 4 times, sixth 4 times and seventh 8 times...in May led the Major Leagues with 28 RBI, the most by a Reds batter in any calendar month since Jay Bruce's 33 RBI in May 2011...in the second inning of the 9-3 win on 4/18 vs Bal snapped an 0-for-13 skid with his first career grand slam (off Kevin Gausman), extending the Reds' lead to 6-1...in the 5-4 win on 4/30 at StL tied his career high with 4 hits and became the first Reds batter with 3 doubles in a game since Ryan Ludwick on 6/15/14 vs Mil...with 1 out and the bases loaded in the 11th inning of the 4-3 win on 7/19 vs Ari produced his first career walkoff hit, an RBI-single off T.J. McFarland...6 times homered in 2 consecutive games...twice in his career homered in 3 consecutive games (5/3-5/5, 2016 & 6/2-6/4, 2016)...was Cin's 2017 recipient of the Heart & Hustle Award for his passion for the game. Among all minor league batters ranked T5th with 30 HR (Sacramento 26, Louisville 4) and T23rd with 87 RBI (Sacramento 80, Louisville 7)...began the season at Sacramento... when acquired from the Giants on 7/31 led the Pacific Coast League in home runs (25) and total bases (218) while ranking among the league leaders in RBI (2nd) and extra-base hits (53, 2nd)...was PCL Player of the Week in April, a mid-season PCL All-Star and Minor League Baseball's PCL Player of the Month for July (10hr, 31rbi, 18xbh, .704slg, 1.082ops)...after the trade, made 25 apps for Louisville before he was promoted on 8/31, when OF Brennan Boesch was disabled... as a pinch hitter in the sixth inning of that night's 13-6 win at Cubs snapped a 5-5 tie with a 2-run HR off Justin Grimm...became the first batter to homer in his first plate appearance for the Reds since Ryan Jorgensen on 8/15/07, also at Cubs (off Ted Lilly)...homered in consecutive pinch-hit apps dating back to 9/28/14 for the Giants (off SD's Tim Stauffer)...made 17 starts for the Reds (15gs in LF, 2gs at 1B), including 5 of the last 6g of the season...his first 4 hits for the Reds were HR, HR, HR, double... became the first Reds batter to produce home runs for his first 3 hits since Brian R. Hunter in 1994...following his pinch-hit HR in his Reds debut, homered on 9/5/night vs Mil and then with 1 out in the eighth inning of the 4-2 suspended game win on 4/12 vs StL snapped the 2-2 tie with a 2-run HR off Jonathan Broxton. Hit .192 (14-for-73) with three home runs and five RBI in 28 games, being called-up to the big leagues four different times...Started 18 games for the Giants, starting 17 at first base and one as a DH...went 2-for-7 (.286) in pinch-hit role (one HR)...Became the 13th Giant to record his first big league hit as a HR in his first game (since 1919) on June 26 vs. Cincinnati...Hit a go-ahead two-run homer off Cliff Lee on July 21 in the Giants' 7-4 win over the Phillies...Batted .298 (107-for-359) with 21 doubles, 27 home runs and 90 RBI in 91 games with triple-A Fresno...Was named to the All-PCL First Team for his efforts with the Fresno Grizzlies...Among PCL leaders ranked second in slugging pct. (.599) and third in RBI...Became the first Fresno player to record at least 25 HRs in under 100 games since Todd Linden hit 30 HRs in 95 games in 2005. Spent his fourth professional season with his fourth different team, playing the entire campaign with double-A Richmond…has moved up each level in all four seasons. Batted .252 (97-for-385) with 17 home runs and 58 RBI in 105 games. Missed a month and a half of the season from April 15 - May 21 witha left thumb injury. Was added to the Giants' 40-man roster on Nov. 20. Was selected as the Eastern League Player of the Week for the period of April 4th - April 14th...Duvall batted .378 (14-for-37) and belted two home runs with 10 RBI during this stretch. Was placed on the disabled list on April 16 with a sprained thumb and later activated on May 21 after missing 23 games. With Richmond trailing Portland by a run in the 9th inning on Aug. 7, Duvall blasted a go-ahead home run as the Flying Squirrels prevailed by a score of 5-3. Hit .297 (43-for-145) with seven home runs and 27 RBI in 38 games for Bravos de Margarita in the Venezuelan Winter League. 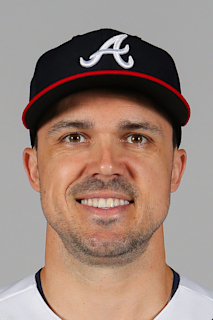 March 24, 2019 Atlanta Braves optioned LF Adam Duvall to Gwinnett Stripers. August 31, 2015 Cincinnati Reds recalled LF Adam Duvall from Louisville Bats. July 31, 2015 Cincinnati Reds optioned 1B Adam Duvall to Louisville Bats. July 31, 2015 1B Adam Duvall assigned to Louisville Bats. March 29, 2015 San Francisco Giants optioned 1B Adam Duvall to Sacramento River Cats. December 4, 2014 1B Adam Duvall assigned to Bravos de Margarita. October 30, 2014 Adam Duvall roster status changed by San Francisco Giants. October 3, 2014 San Francisco Giants reassigned 1B Adam Duvall to the minor leagues. September 2, 2014 San Francisco Giants recalled 1B Adam Duvall from Fresno Grizzlies. August 25, 2014 San Francisco Giants optioned 1B Adam Duvall to Fresno Grizzlies. August 10, 2014 San Francisco Giants recalled Adam Duvall from Fresno Grizzlies. July 29, 2014 San Francisco Giants optioned 1B Adam Duvall to Fresno Grizzlies. July 21, 2014 San Francisco Giants recalled Adam Duvall from Fresno Grizzlies. July 4, 2014 San Francisco Giants optioned 3B Adam Duvall to Fresno Grizzlies. June 25, 2014 San Francisco Giants recalled Adam Duvall from Fresno Grizzlies. March 12, 2014 San Francisco Giants optioned 3B Adam Duvall to Fresno Grizzlies. November 20, 2013 San Francisco Giants selected the contract of Adam Duvall from Richmond Flying Squirrels. October 10, 2013 3B Adam Duvall assigned to Bravos de Margarita. May 21, 2013 Adam Duvall roster status changed by Richmond Flying Squirrels. April 2, 2013 3B Adam Duvall assigned to Richmond Flying Squirrels from San Jose Giants. February 1, 2013 San Francisco Giants invited non-roster 3B Adam Duvall to spring training. April 2, 2012 Adam Duvall assigned to San Jose Giants from Augusta GreenJackets. April 5, 2011 Adam Duvall assigned to Augusta GreenJackets from Salem-Keizer Volcanoes. June 19, 2010 Adam Duvall assigned to Salem-Keizer Volcanoes from San Francisco Giants. June 18, 2010 San Francisco Giants signed 2B Adam Duvall.